In 12-inch skillet, cook beef over medium heat 8 to 10 minutes, stirring occasionally, until thoroughly cooked; drain. 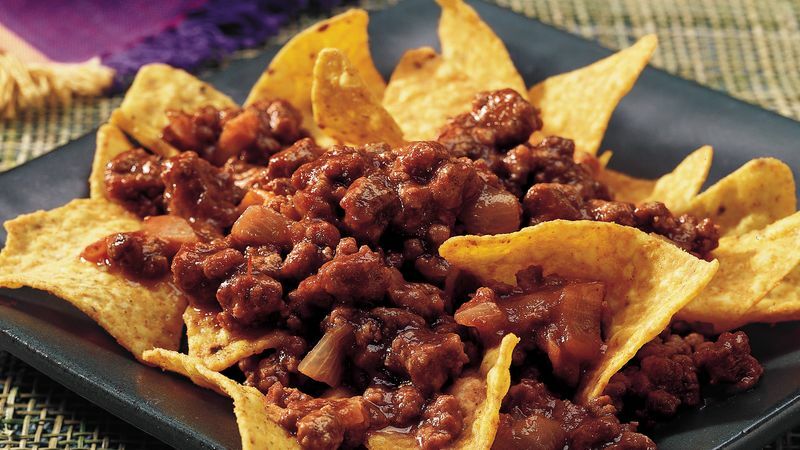 In 3- to 4-quart slow cooker, mix beef and remaining ingredients except tortilla chips. Cover; cook on Low heat setting 4 to 6 hours. Serve over tortilla chips or in buns. Serve this tasty beef mixture in the usual buns or over hot cooked rice or pasta for a change. Freeze leftovers in a freezer container for up to 4 months. To thaw, place the container in the refrigerator for about 8 hours or defrost in the microwave.